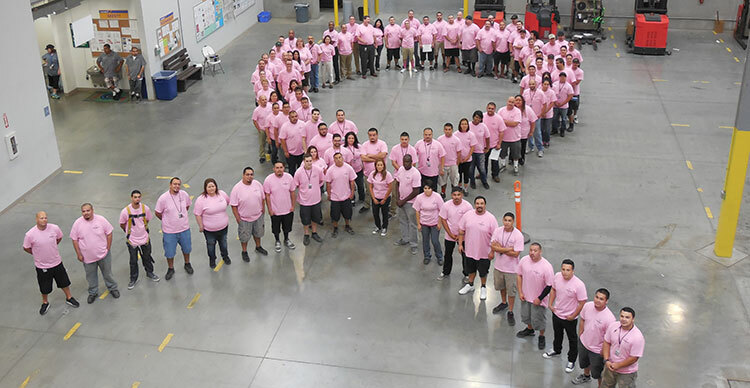 VWR associates at the Visalia, California location support breast cancer awareness. We do this through volunteering, participating in events, donating goods and dollars. Each location looks for opportunities where a group of associates can participate. This helps to improve camaraderie, strengthen our team and give associates a sense of pride. We are equally proud to have these associates representing VWR in our communities. Each of our major locations has a Wellness Team who focuses on identifying community events that promote good health such as a walk, 5K, or triathlon. Both associates and their families are often invited to join. Ideally, these events also include a giving component to an organization that is aligned with the Avantor Foundation mission. Outside of events led by the Wellness Team, VWR supports associates in their personal charitable interests for similar events. If an associate wants to participate in an event as an individual or put together a group of fellow associates, VWR can help by promoting the event internally, sharing stories of success, paying for a portion of registration fees, or making donations through the Avantor Foundation’s matching program. Our locations will often collect needed goods for local organizations. VWR has hosted a variety of drives ranging from canned food to clothing to toys. VWR works with national organizations, such as NAIER, to provide product donations of obsolete products to help those in need in the science community.